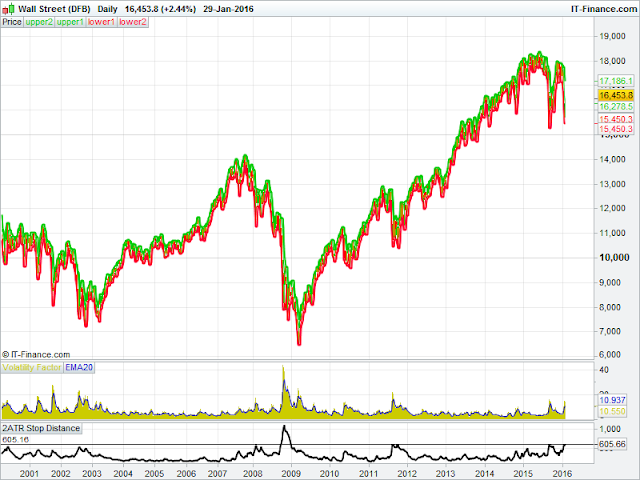 2008 through to early 2009 - when we were in the throes of the financial crisis and the big market downtrend. Before that you had to go back to 2002 to find similar levels of volatility- and that also coincided with a market downtrend. This shows that, even when there is a short period where prices drop, volatility tends to increase. Based on his own volatility indicators, Van Tharp has stated that he has never come across a downtrend that isn't volatile. So the current level of volatility in the market highlights the different market conditions that people relatively new to the markets may now be experiencing for the first time. But is it as bad as those previous occurrences? I decided to look at this further, and amended the 2ATR measurement calculation to express this as a percentage of the current price, rather than on a pure number of points basis. Well, ordinarily you would expect the inherent volatility to increase as the base price of a stock, index or other instrument increases. We are currently over the 16,000 level on the Dow whereas in 2002, for example, the index dipped below 8,000. So, all things being equal, if the markets now were truly as volatile as back in 2002, you would expect the current 2ATR measurement on a pure points basis to be twice as high now as it was back then. 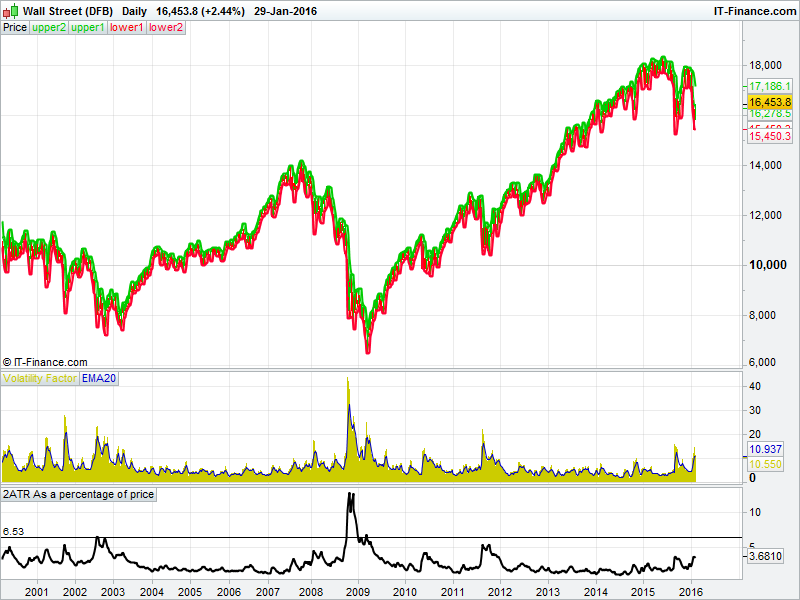 I've drawn a line across the highest 2002 readings, and you can see that, when calculated on a percentage basis, the current level of volatility is nowhere near as bad as it was in 2002 - it's actually not much more than 50% of the readings back then! And as for 2008, this percentage-based 2ATR measurement peaked around 12.6. That makes the 2008 readings more than three times higher than what they are now. So while people may say that the current markets are really volatile, you need to put it into context. Certainly based on recent market conditions, then yes they are. But when comparing back to the two previous market downtrends in the 21st century, we are nowhere near those levels of volatility - yet.